Eastern Washington has unpredictable winters, one year we could be buried in feet of snow and the next winter will resemble spring weather. The last few winters have been rather snowy and terrible, which has done nothing but further our resolve to get into RV and head south for winter next year. One of the bad Eastern WA. 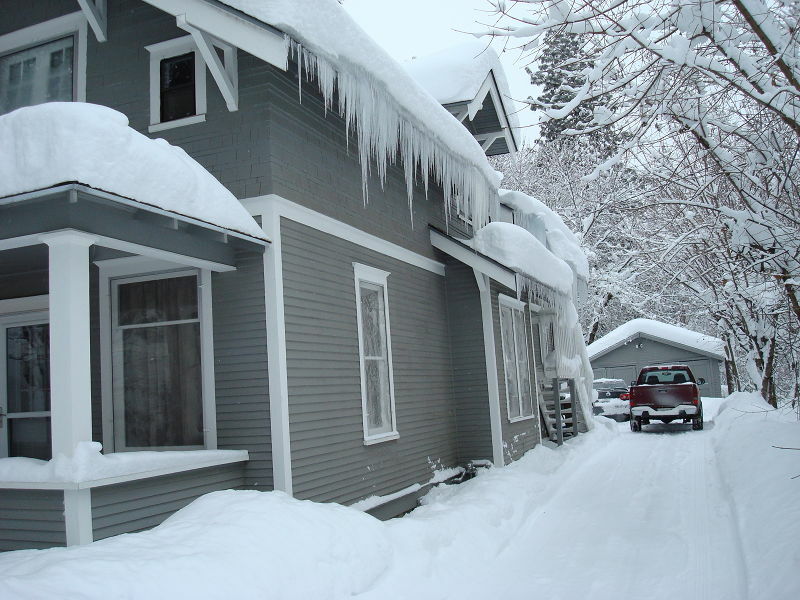 winters at our old house. What does this have to do with RV wiring? Every year when we put the RV away for winter, making it sit unused for a longer period of time, issues tend to arise when we try to use it again. The best scenario would have us taking it for a drive to run the engine, generator, and aqua-hot systems once a month or so. Basically to blow out the cobwebs and lubricate everything. Sitting still isn’t good for RV’s. Unfortunately, this isn’t possible where we store it, the weight of the RV would leave large ruts in the road if by some miracle we didn’t get stuck in the mud. I decided not to run the generator either in fear of the mice (see post about mice) deciding to make a home near the warmth. What does this have to do with RV wiring? When I stored it for winter I raised the jacks a little bit to take some of the weight off the tires. I was going to lower the jacks a few weeks ago and there was no power at the jack control panel. After some research, I believed that I had narrowed down the problem to a possible ground issue but the dash would need to be disassembled to get to it. Upon googling this set of problems, apparently this is a fairly common problem. Many manufacturers were known to install one ground wire and then daisy chain it to everything else. This set of circumstances fit the problems I was having, it wasn’t just the jack control panel that stopped working. All the dash gauges that were connected to that ground wire begin at the ignition, these were also not functioning. Diagnosing the problem is one thing, gaining access, confirming the actual problem, and actually fixing it is another. After taking out the ignition cylinder I noticed there wasn’t enough access to the wiring harness that plugs into the ignition in order to check the condition of the wires and connections. Maybe I could gain access by removing the center console? Ha, that was wishful thinking. 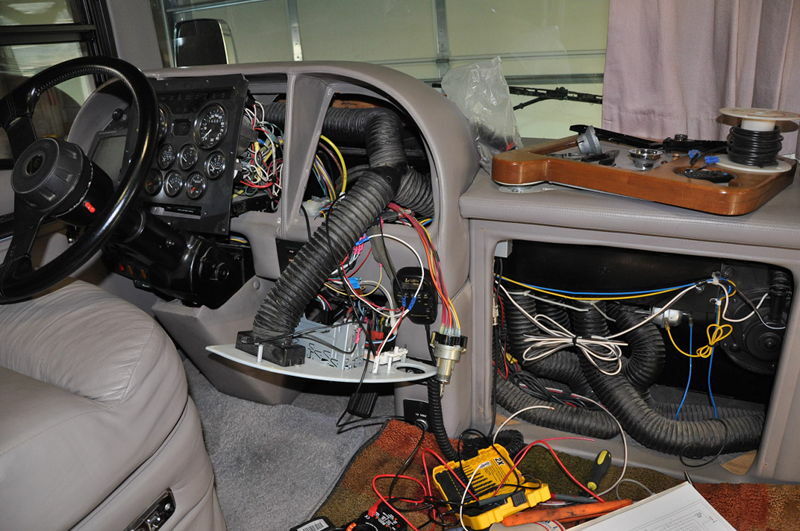 Most of the dash will need to be taken apart to gain access to the ground bars and wires. The good news is every time I take something apart I learn where and how to access other systems that will need fixing later. I do have all the diagrams that came with the RV, but I feel they aren’t very good. The diagram will tell you that this wire leads to a box, relay, solenoid, etc. But it doesn’t tell you where it is located. Is that in the front electrical bay, under the dash, rear electrical bay, under the kitchen sink, between the frame rails in the basement, or buried in the wall. These are all places I have found these things. After all that disassembly and dealing with all those wires, the bad ground diagnosis was incorrect. I ran a new ground wire through the firewall and connected it to the frame (a known good ground). Still, nothing was functioning properly. Which means, if it’s not the ground, it must be the power. Next, I moved on to the ignition switch and decided to replace it. Nope, no luck there either. I must admit that electrical issues are not something that I had to deal with when I was in the automotive industry. I was stuck in the paint booth most of the time or behind a computer screen. 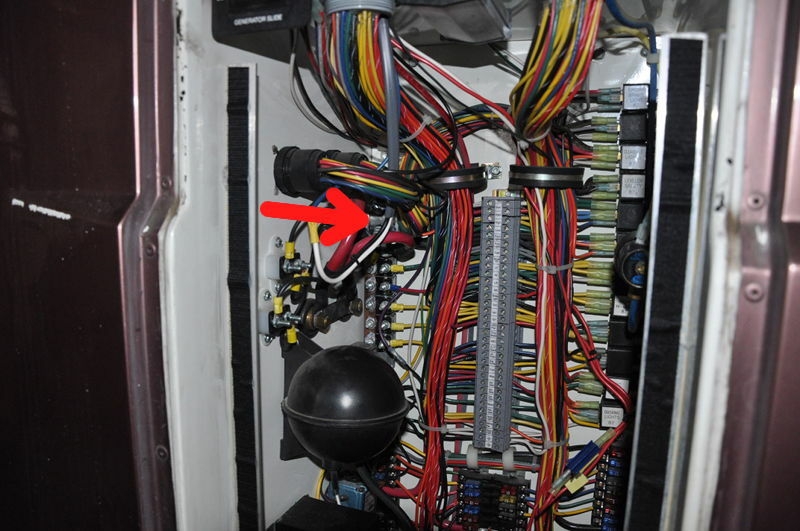 But, I better get used to it, many problems that occur in an RV seem to be related to electrical problems. After changing the ignition switch and still having an intermittent problem I started to test everything with the 12 volt test light. Back at the very beginning I didn’t have a test light with me and while checking a solenoid in the front electrical bay, I only heard the solenoid click but didn’t check to see if the power was going through it. This was a big mistake and it led me down a path that took me full circle back to one of the first things that I checked. The true problem turned out to be the solenoid that I checked at the beginning but diagnosed it wrong. This mistake made me spend two days of taking the dash apart, removing and testing relays, testing solenoids, checking ground wires and bars, changing the ignition switch, and all the stress that comes with it. Bad Solenoid hiding behind the cluster of wires. But I did learn quite a bit about the wiring behind the dash while I was in there, so it’s not a total loss. Also, I found the insanely loud low air buzzer and wrapped it with a piece of tape to muffle it a bit. Even at half the volume, this thing is still loud, hearing it at half volume won’t be a problem. Unfortunately, I didn’t find it until the second day, I had to listen to that thing screaming in my ears for a whole day. After 15 years in the automotive industry I forgot the most important lesson when working on vehicles, the acronym K.I.S.S., keep it simple stupid. Luckily my brother was around to remind me of this and it led us to the real problem. Thanks to him I didn’t spend another couple of days banging my head against the wall. Since we are on the topic of electrical, we received our pallet of batteries last week. 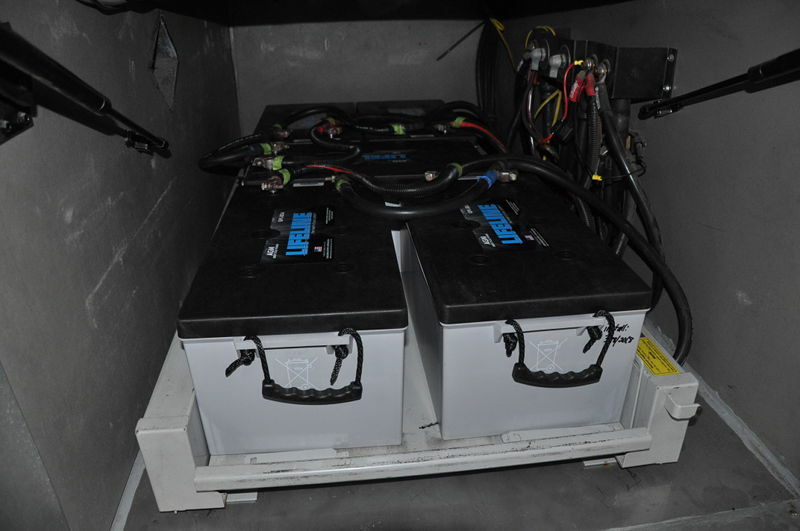 We were able to install our new Lifeline GPL-8DA batteries this last weekend. 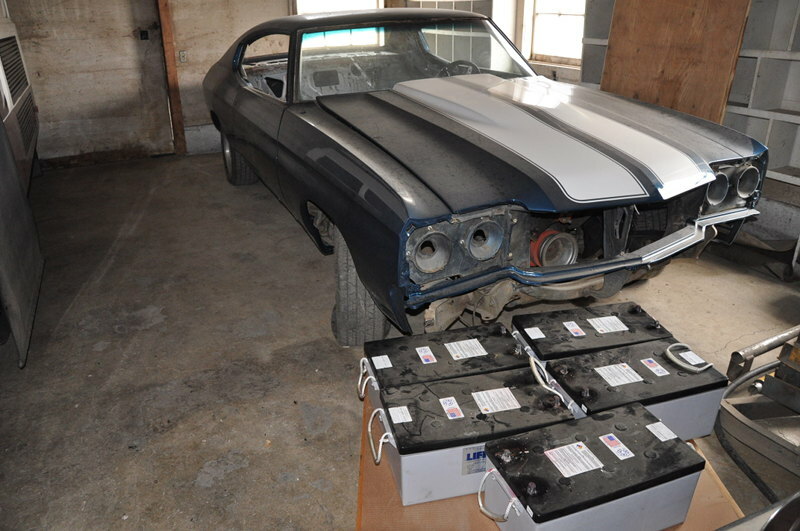 This was not an easy process to remove and install 800 pounds of batteries. It was hard work but we were able to get it done in a couple hours. We are looking forward to testing them out here in the very near future. If anyone is in the market for Lifeline batteries, I highly recommend Centex Batteries in Texas. Marc was easy to deal with and very helpful. Fast shipping and by far the best price I could find. Also, since I’m in Washington state, no sales tax. I would gladly use Centex Batteries again in the future. Previous PostPrevious The Purge Continues… And Do We Bring This?